Not all punchcutter's tools will need their own discussion thread, so it might be useful to have a thread devoted to miscellaneous tools. Please add more! 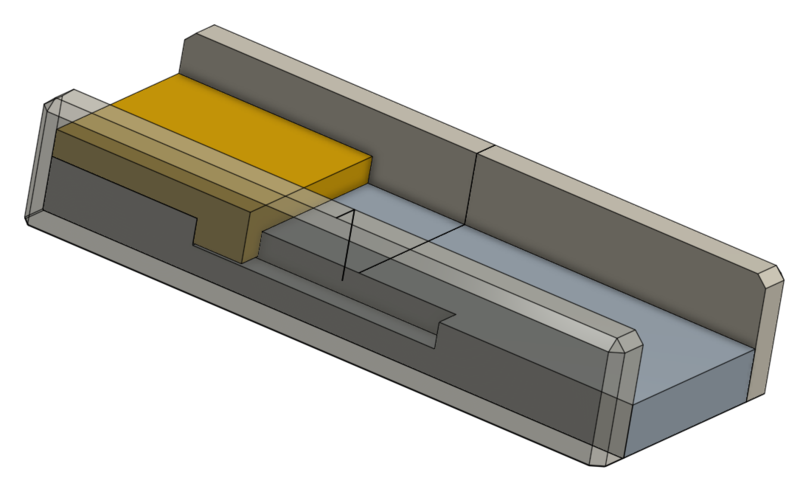 A fixed height-to-paper (type height) gauge. 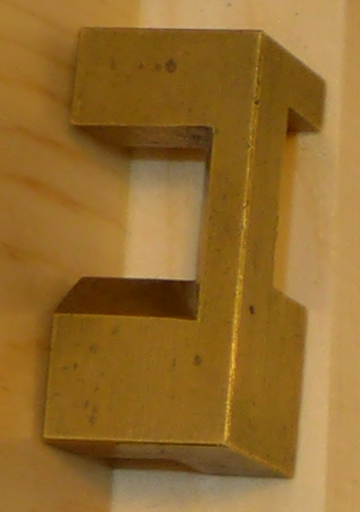 A fixed type height gauge with a sliding square, after a design by Henry Barth, digitally reconstructed. 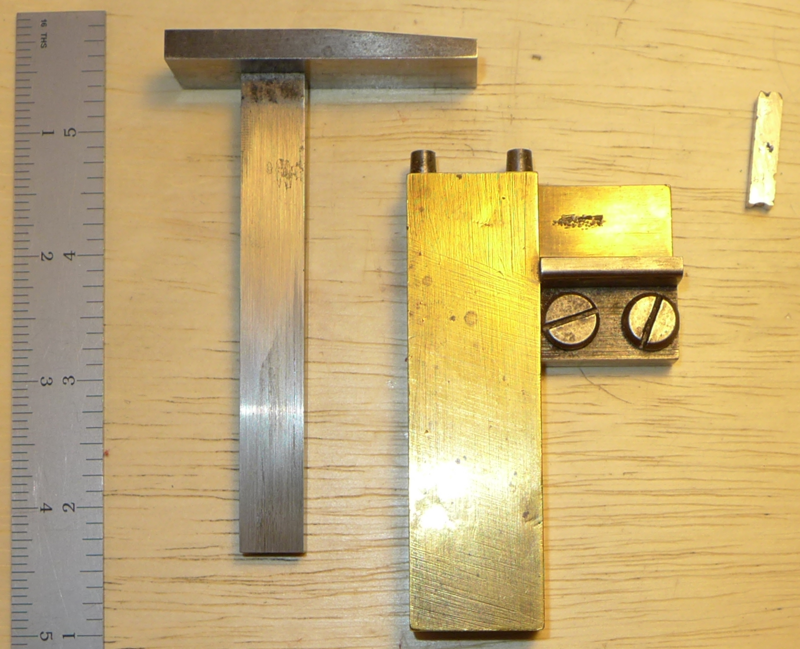 A face squareness gauge, by Stan Nelson. 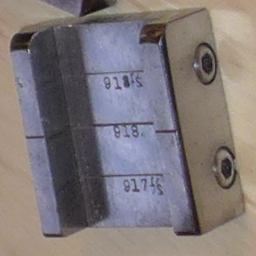 A caliper-style type height and face squareness gauge. What about white spirit as fluid for the Pigeon lamp? Thats is what I am using and it works fine. I think the original 'petrol' used in them was close to white spirit (AKA Benzene, White Nafta, Was-benzene, Benzina). It's dry cleaning solvent, also used in the past as Zippo-like lighter fluid. Nick Gill is using kerosene in them. That is also what Paul Koch recommend in his famous Dolphin article. What I like about the Pigeon lamp is: They look great and they emit A LOT more soot than a candle. Whatever fuel you use, check its "flashpoint" (the temperature at which it will ignite if there is an ignition source such as a spark). The problem with gasoline/petrol is that its flashpoint is surprisingly low: negative 45 degrees Fahrenheit (about -43 Celsius). Yes, negative. So in practical terms gasoline/petrol is always well above its flashpoint. By way of contrast, the flashpoint of kerosene is (positive) 100-162F, and that of consumer "lamp oil" is usually around 140F - generally above room temperature. Kerosene in a Lampe Pigeon style lamp (that is, one with the body filled with felt) works fine. So does lamp oil in a regular decorative oil lamp. I haven't yet tried lamp oil in a Lampe Pigeon/Olympe. A US importer of cheap shiny brass lamps (mostly made in India), "Vermont Lanterns," has a good FAQ on some issues involved with fuels for these lamps: https://www.vermontlanterns.com/search/node/faq They're promoting their own lamps, of course, but still they have some useful information. It is interesting that their objection to kerosene is that it produces too much soot - but in our case, soot is exactly what we want. 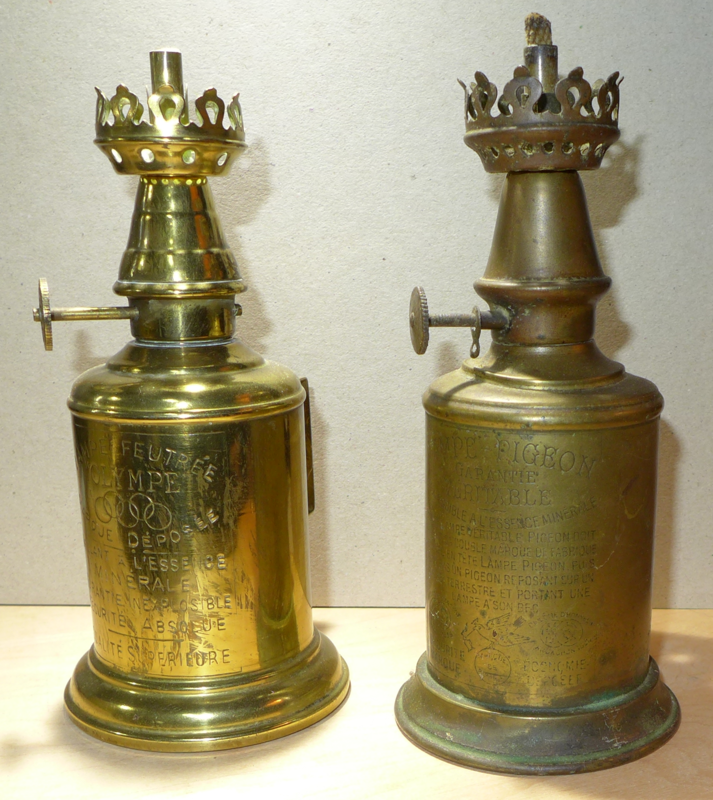 Here's a picture of a smoke proof done using a cheap ($16.97) modern brass decorative lamp burning a "lamp oil" typically sold for use with this kind of lamp (see the "Vermont Lanterns" FAQ for brands). 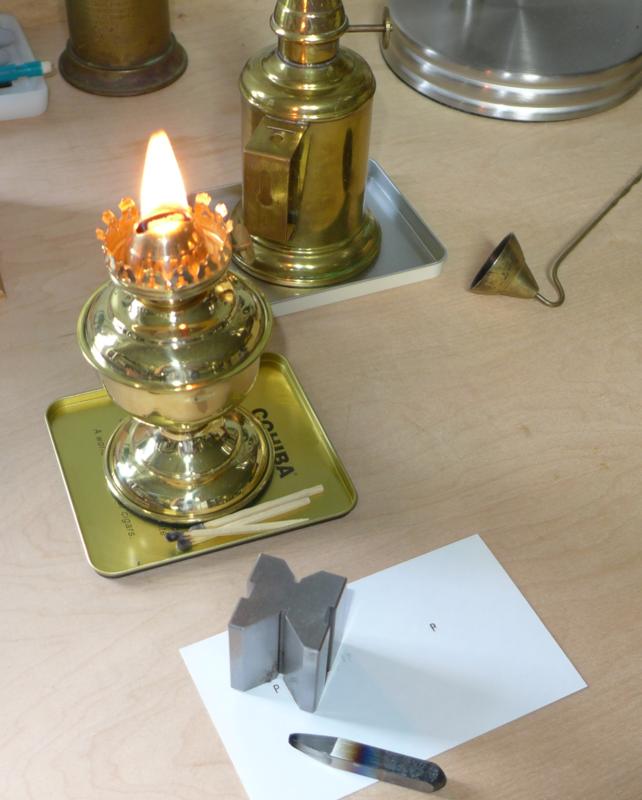 Alongside it is another proof done with a vintage Lampe Olympe burning kerosene. Both work well. I used a machinist's V-block as a smoke proofing fixture (guide). Good tips on fuel. I will switch to kerosene. Here's another "minor" tool - but an exceptionally clever one. 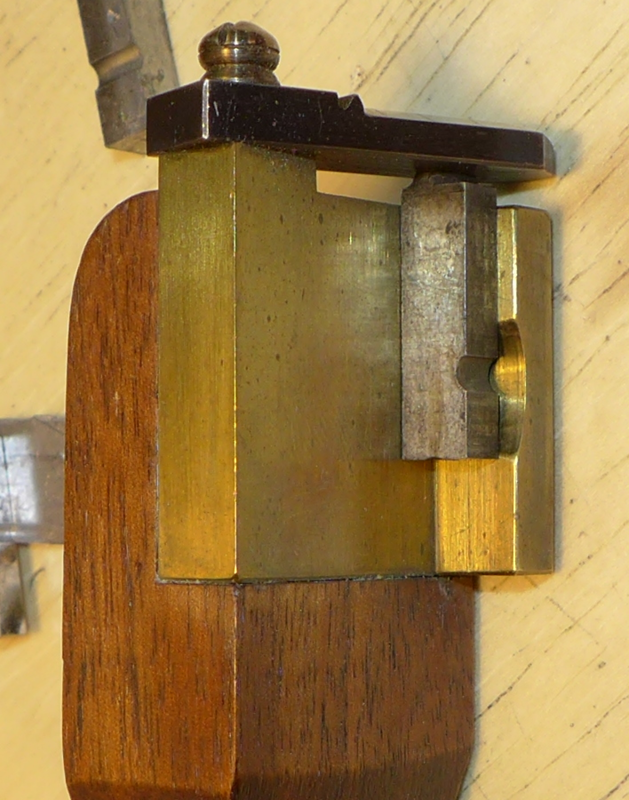 It is a jig that you apply to the punch (or put the punch in, depending on how you look at it) which allows you to scribe a line across the body of a punch blank. This scribed line would then be made deeper using files and would become the "signature" line which identifies the side of the punch corresponding to the bottom of the letter. I do not know the origin of this tool. It may be in the literature somewhere, but I can't recall having seen it. The one shown here is one that Stan Nelson made. You can of course just use a regular machinist's square when scribing the line. 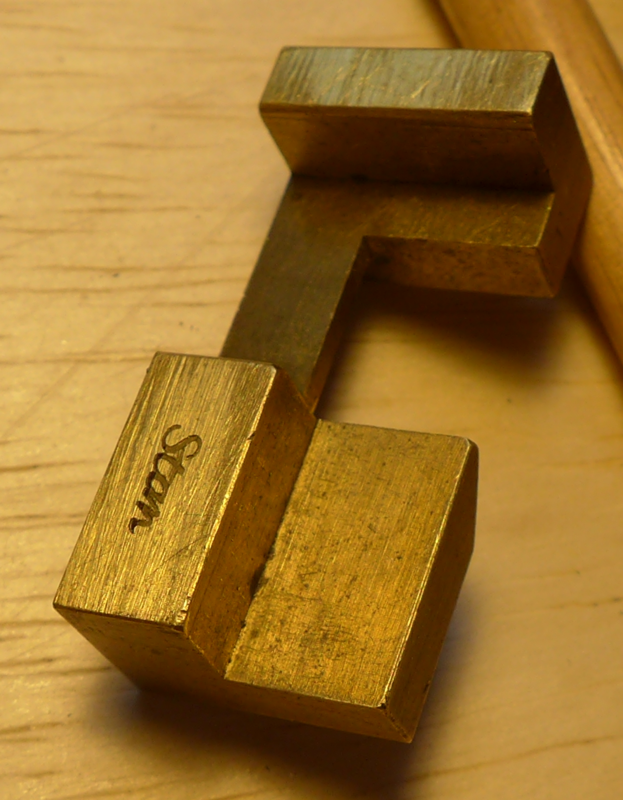 The two advantages of this jig are that it is easier to hold against the punch than a machinist's square and it always puts the signature line in exactly the same location without having to measure. I don't even know the proper name for this tool - "signature jig" is just what I'm calling it now because I have to call it something. Just a couple of things, the lamps are freely available here in France secondhand at the Vides, these are similar to carboot sale or flea markets and are held in the villages every Sunday during the summer, they go for between 5 to 10 euro's and at ten you can knock them down to 7 euro's they expect it, They are available new, but expensive, also, the one at the Imprimerie have had tops made for them that go over the wick. one thing we get here is lamp oil, which is specially made for them and is available in the supermarkets for a couple of euro's, this is the only thing to use, nothing else or as David says, there could be dire consequences. I made drawing of the signature tool at the Imprimerie Nationale, and have so far made four in a production run, and could make some more if anybody is interested, I shall post a picture on Instagram as the pictures are on my phone. I am curious about the signature jig, in Stan Nelson's video and as described elsewhere it looks like it is used to scribe a line on all 4 sides of the punch to mark where the slope to the face starts. Is this jig used to mark both that and the signature line or are there two different jigs, or is it just a matter of which way the punch is inserted?